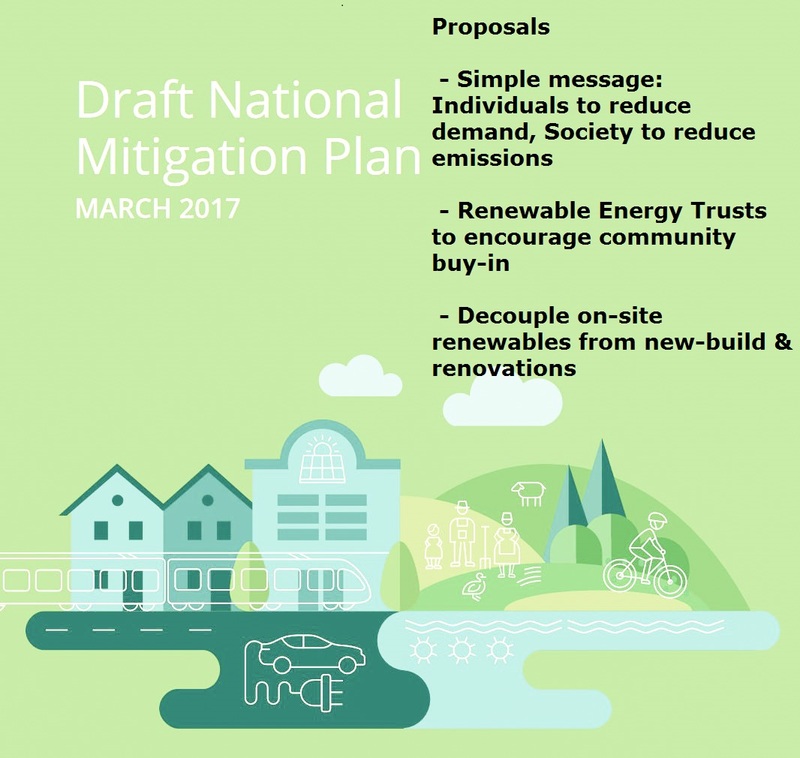 kiss engineering: Ireland's National Mitigation Plan - Opportunity for Renewable Investment Trusts? 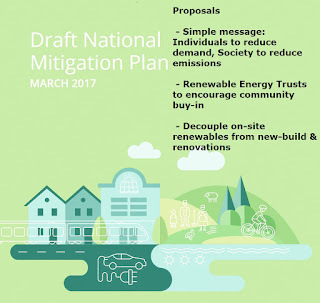 Ireland's National Mitigation Plan - Opportunity for Renewable Investment Trusts? However in lieu of jumping on the bandwagon of criticism, I wish to outline my proposal for improvement to the plan, to get it a state where it can be compared to the Dutch Delta Works for legacy. Congratulations on the inclusive tone conveyed throughout the document, making the point that we are all part of the solution. Correct socialisation of the problem will go a long distance in order to gain the public's ownership of the plan, and a consistent message should be delivered to them (including the media as stakeholders). individuals should consume as little energy as possible, and as a society, we should reduce our harmful emissions when generating energy. This message is not fully possible presently, as people refine their own energy every day (e.g. gas boilers generating heat, internal combustion engines generating movement) but if the shift were to occur so that the emissions from generation were controlled at a national level, greater improvements could be managed. My comments come from the perspective of a citizen, with experience in the Built Environment. 1. What further contribution should renewable electricity make towards progressing the transition to a low carbon society and economy? How should this be facilitated? By not being bound by the EU target, and creating an equitable, easily accessible environment for investment by all citizens. By progressing to a low carbon society, based on further contribution from renewable electricity, a number of benefits can be realised on a societal level. These include improved air quality, attractiveness to (eco) tourism, a collective sense of accomplishment due to adopting a more sustainable means of powering life, and a sense of reduced risk due to energy independence. These benefits can be facilitated in society by aiming to exceed the EU minimum target, as a collective societal goal. Significant capital investment would be necessary, from both the exchequer, and private commercial sources, in order to realise the low carbon economy. Under section 2.3 of the plan, it is noted that the financial institutes must take part in growing the renewable energy portfolio. Whilst this is true, there are intermediate steps which can be taken in order to greater facilitate the financial institutions releasing funding. In order to stimulate private investment from individuals and institutions alike, I propose definition of "Renewable Investment Trusts", similar to the recent-to-Ireland Real Estate Investment Trusts (http://www.ise.ie/Files/A-Guide-to-REITs-for-retail-investors.pdf ). If Renewable Investment Trusts were enacted to funnel investment, they could prove a suitable vehicle, with simplicity & standardised rules to allow for to investors, to share in the profits from Renewable Energy in exchange for their input equity (e.g. finance, land, acceptance etc.). Also, for those investors providing finance for capital seed costs, the elimination of corporation tax (as seen in the Real Estate Investment Trusts) would prove attractive. Should the economy in future need tamping down, similar to conditions seen in the early 21st century, a version of the SSIA scheme could be proposed by the government, to encourage saving by private individuals in these Renewable Investment Trusts, whereby partial investment matching by the government could be made. 2. In conjunction with the need to improve the energy efficiency of the built environment through deeper levels of renovation, how do we realise the opportunities that decarbonisation of large scale electric power generation provides to decarbonise the heating and transport sectors through electrification? By addressing the risk to successful adoption of electric heating & vehicles with the potential achilles heel of decarbonised electricity, namely how to deal with more variable electrical supply at grid level and increased demand. There is a possibility that a decarbonised electrical grid will have variable supply capability across the course of the day, be that due to the wind not blowing or the sun not shining. This reality, coupled with a finite supply of base load carbon power plants (some of which have a delayed ramp up of supply capacity), and increased demand on the grid for heating & EVs, means that pragmatic, proactive management of demand should be instigated. In point 3 below, I espouse funding stream for grid management of that problem, however at customer side some measures may be needed also. Means of providing buffers on the customer side to store variably supplied electricity (be that batteries or high thermal mass in homes to store heat) should be encouraged. A number of schemes exist that aim to manage demand based on grid conditions (https://www.electricireland.ie/business/help/efficiency/reduction-schemes-and-how-you-can-save-on-energy-costs ) which are targeted at larger energy users. Consideration should be given to including the users of EVs & heat pumps in demand management schemes, upon presumption they have a means of buffering energy. I additionally propose for both renovations & new builds, a decoupling of the need to provide sustainable renewables generation, on-site. The present arrangement per Part L of the Building Regulations (https://passivehouseplus.ie/news/energy-performance-of-buildings-directive/dept-of-housing-set-to-launch-new-part-l-for-non-domestic-buildings ) is that renewables need to be generated on site. Greater efficiencies & effectiveness could be achieved if it were possible / permitted to provide those renewables off site. Then, at building design level, the designers should focus their attention on producing a building which has the lowest power consumption needs practicable, and at renewables generation level, a similar efficiency can be achieved, at scale. The present arrangement is sub-optimal, as it pushes designers of buildings to include technologies which they may not otherwise wish to (e.g. CHP, solar thermal etc. with carbon based backups) in order to achieve a mandated renewable proportion. And with those carbon based backups, there can be instances when the renewable energy technologies are not operational, and the buildings have reverted to using the carbon based energies fully. The Renewable Energy Trust concept I propose could be, if properly regulated, a suitable means to funnel investment from providing on-site, possibly sub-optimal, renewable generation, to off-site, well managed renewable generation. And the designers of these new buildings, and retrofits, can instead focus on a singular, electrical based method of providing heating, completely optimised (rather than permitting carbon based backups). 3. How can we enhance community engagement with decarbonisation of the electricity system, including achieving greater social and community acceptance of necessary associated electricity infrastructure? and facilitating sharing in the profits from deployment of renewable energy. Considering the national community, presently electricity consumers pay a PSO levy to support renewable energy (per http://www.cer.ie/document-detail/PSO-Levy-2016-17/1074), in addition to a standing charge & per kWh costs. Collection of this PSO levy should be refocused, so that it does not apply to those consumers who choose renewable sources for their electricity. To make up the shortfall in funding to provide the required grid support for fluctuating supplies from renewables, the cost should be shifted to the renewable suppliers, and worked into the xUoS also. This is attractive from a consumer's perspective, as they can more see the effect of their sustainable energy choices due to their bills being more directly related to their consumption. And they see a financial advantage to choosing a renewable supply of energy (even if it's more expensive at higher consumption) - presently the only driver to chose a renewable supply is the consumer's goodwill/sense of conscience. From the electricity supplier's perspective, the incentive of passing the PSO cost to them should be tied to the consistency of electrical supply they provide - if the supplier can provide a consistent electrical supply (e.g. in the case of wind power, if the supplier had utility scale backup batteries for x number of days) they need not pay the PSO levy, and so can offer a cheaper price to the customer. Or if the supplier cannot provide a consistent supply, and requires grid stabilisation by others, they should pay the PSO levy. Considering the local communities where renewable generation equipment is to be located, the present norm is to offer incentives (e.g. community centre buildings), once-off payments & ongoing payments in order to compensate people for the negative effects associated with renewable supplies (e.g. the visual impact & noise impact). The relationship between local communities should be redefined to focus upon the positive input that communities can offer to the enterprise of generating renewable electricity. If Renewable Investment Trusts (as espoused in question 1 above) were enacted to funnel investment, they could prove a suitable vehicle, with standardised rules to allow local communities share in the profits from Renewable Energy in exchange for their input equity (e.g. land, acceptance etc.). 4. How can spatial planning for renewable electricity infrastructure be made more efficient and effective? By delegating the EU renewable target for Ireland to the communities around the country (nominally country councils), and incentivise those communities to attract renewable investment. By socialising the national renewables target to local authorities, a bottoms-up approach to proposing sites can be sought across the country. And a means for ensuring compliance can be sought by tying compliance with exchequer financial contributions to the local authority, in order to achieve the national goal. An enhancement to the proposed Renewable Investment Trust concept put forward in question 1 could be that a certain shareholding is reserved for the host local authority. 5. What other renewable technologies should be considered in order to diversify the power generation mix and progress the transition to a low carbon society in a cost-efficient and cost-effective way? In order to gain buy-in generally to renewable energy by individuals, which benefits the national grid, greater aid to support domestic Photo Voltaic should be provided. This should be by way of expanding the SEAI Better Home Scheme, and the feed-in tariff to individuals. Whilst PV has a long payback period, it is simple to use for the public (compared with other renewable energy such as solar thermal). Consideration should also be given by the Irish Government to invest in Nuclear Power generation, be that on the island of Ireland (unlikely to be palatable by the public?) or via inter-connectors. 1. What further practical measures could be introduced to encourage and enable householders in undertaking deep energy efficiency renovations to their homes? - increase operational cost to householders with inefficient buildings. This can direct costs (e.g. energy costs or tax/levy on same) or related to the BER certificate. This discouragement (the stick) should be used to embed the mindset that constant improvement (in an energy sense) is the norm. - de-risk the prospect of not seeing a return on investment from more expensive energy retrofits (e.g. External Wall Insulation) during householder's ownership period of a given dwelling by introducing stamp duty exemptions. In this manner, people will not be afraid to make an energy investment if they might sell in a few years... This should be seen as a carrot measure. - expand SEAI Better Energy Home grants for heating sources that use electricity (e.g. heat pumps) and photovoltaic electricity sources. - enable a situation whereby less optimised electric heating solutions can be used (compared to state of the art) e.g. in lieu of low energy demand electric heat pump type systems, which require deep retrofit to be integrated successfully, permit the use of less efficient instantaneous / storage resistive heating with a corresponding increased contribution to low carbon generation. It is advantageous to be pragmatic with demands on householders: to move them from oil boilers & LPHW radiators & immersion coils to heat pump capable underfloor heating loops with deep bores etc. is extremely invasive. A simpler solution from the householder's perspective is more palatable, and if the energy supplied is carbon efficient, it is a superior solution than the status quo. Reduction of heat should continue as a policy through insulation measures & better space heating controls (perhaps with a corresponding increase in SEAI Better Energy Homes grant amounts). The ESB Gold Shield concept could be considered as a basis for this strategy: https://web-beta.archive.org/web/20031218104028/http://www.esb.ie:80/main/energy_home/ef6.jsp if corresponding de-carbonisation of the grid were to occur. 2. How should the Government support those who do not have the financial means to engage in renovations, for example those in energy poverty? Both the homeowner's interests and the Government's interests need to be considered and understood here. And it should be noted that possibly by solving the poverty issue directly, the emergency poverty (and emissions from same) would probably follow on & be solved accordingly over time. I recommend addressing the root cause of the poverty issue firstly. In absence of addressing the poverty issue, it is assumed that the homeowner can pay the price of energy they consume, and reduce their energy demands sufficiently when necessary whilst suffering from energy poverty. This energy is typical not efficient or sustainable (e.g. older boilers or solid fuel, low efficiency cycles, and perhaps a dependence on older car). The Government wishes to reduce the county's climate emissions. This can be achieved by changing the energy demands of the homeowner and/or changing their fuel. It is assumed the government has no wish to fund these upgrades to reduce energy demand directly. To reduce individual homeowner's energy demand (e.g. through renovation) something such as the PACE from the US could be considered to fund upgrades (https://en.wikipedia.org/wiki/PACE_financing) however appropriate adaptation to Irish norms would be needed, and cognisance of the potential costs with same should be made aware to all. In this manner, at homeowner level, minimal investment would be necessary, however society reaps the reward of reduced carbon emissions. Controls should be provided in this scenario, to ensure quality of service to those other homeowner who reduce their energy demand from the grid get a consistent supply of electricity, whereas those more dependant upon variable power supply should reduce their demand accordingly. 3. How can we motivate the construction industry to promote deeper energy renovations to their clients? Reliability is a primary concern for many construction industry clients, so the professionals in that industry will seek to minimise risk to their companies through promoting technologies & techniques which haven't failed them in the past. - make it worth their while - both financially & through legislation, to provide deep energy retrofits. Often times, clients will wish to undertake general renovation works, without any knowledge of or desire to improve their energy consumption. - make deep energy improvement techniques & technologies simpler to implement & later support. This extends to all elements of implementation from sourcing information, training, focus upon simple measures etc. Perhaps design review clinics can be provided (similar to how local authorities provide pre-planning permission clinics http://www.meath.ie/CountyCouncil/Planning/PlanningPermissionOverview/) to encourage building professionals to adopt better energy techniques. 4. For those householders and businesses that have carried out energy efficiency improvements, how should we encourage the adoption of low carbon heating solutions, including those that would facilitate the decarbonisation of electricity generation? - Expand the SEAI Better Energy Homes grant to include Heat Pumps, or a combination of Electric Instantaneous Heating/Storage Heating with investment in low carbon electricity generation. This should be as an alternative to the SEAI BEH grant on offer presently for boiler replacement. 5. How could the regulatory regime be developed to best complement Government incentives and supports for the residential and commercial sectors post-2020? in this scenario, the regulatory regime should focus on both side of the coin (energy demand & energy generation). Whilst mandating reduced energy demand through regulatory methods should apply to new builds (both in terms of site locations & building standards) and those who wish to renovate, care should be taken that the costs of construction & delays / difficulties with more sustainable construction do not excessively frustrate new construction. Such a scenario could cause reduced investment and gain sustainability a bad reputation. For that manner, regulation to energy generation should be applied significantly to de-carbonise the supply side (so that even if the existing building stock is less efficient than it could be, at least the energy supplying it is less carbon intensive). The energy supply industry can handle environmental regulations much more readily than the typical householder or Small Medium Enterprise, and so greater successful regulation can be applied. There is less likelihood that public discontent with environmental regulations will garner sympathy with consumers, if they are applied to the energy generation companies, given the possibility to move company to a more sustainable supplier.